The monotheistic religions hold in common one sacred doctrine, that God is one and there is only one God, by definition. During Biblical times, this view, held exclusively by the Hebrews, was in stark contrast to the polytheistic religions (many Gods) practiced by the Greek, Egyptian, Canaanite, Babylonian, and Persian cultures. The covenant established between God and Israel is reliant upon the recognition by His people that God is the one and only God, and strong warnings were given in the Old Testament against making and worshiping idols - a practice which was common at the time even among the Israelites. The importance of this law is illustrated by its being the first command of the Ten Commandments given to Moses. It should be noted that the "other gods" warned against here are not gods at all, but substitutes for God (idols), demons, or simply mythological. 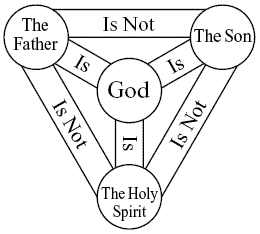 The Trinity of God is central to Christianity and it is used to describe the belief that God is a Father, a Son and a Holy Spirit. It is derived from the Latin word Trinitas, meaning, "threeness." Neither the word "Trinity" nor any equivalent occurs in the Bible, but the doctrine is logically derived from many statements spread throughout the Scripture. The Bible teaches that God is indeed one God but that there are three distinct natures or manifestations to the world which are Jesus Christ being the Son of God the Father. The Holy Spirit is to be accepted into a person's life upon faith in Christ's life, death, and resurrection, and as such is considered to be God. As Adam is described in Genesis as being made in the image of God, an important subject in Biblical ontology is regarding the aspect of God that humans now possess. There are 2 basic definitions of the image of God. Adam was created to reflect the spiritual nature of Elohim (Hebrew: אלהים, ʼElōhīm). This belief, by far the most widespread among theists, holds that Adam was created in God's spiritual image, to reflect his reason and personality and ability to communicate. However, it is not believed that Adam was created in God's physical image, because it is believed that God has no physical existence or appearance. The same words used for image (צלם, ẓelem), and likeness (דמות, demūth), are used to describe the sons of the patriarchs. Elohim is a plural noun, derived from the many references to such with phrases of; "Let us make Man in our image," implying that the Elohim is plural, to include Jehovah Elohim and the Sons of God, as well as the Holy Spirit decided to create man in their image. However, a closer examination of the Hebrew text reveals that this is incorrect. While the Hebrew word Elohim is plural, it is usually followed by a singular verb when referring to YHWH as in Genesis 1:1 where the verb ברא, baraʻ is singular — literally meaning "He created", possibly insinuating the mystery of the Blessed Trinity, while Elohim when referring to pagan gods is generally followed by a plural verb. There are exceptions to this rule as Elohim, when referring to YHWH, is followed by a plural verb in Genesis 20:13 , Genesis 35:7 , 2_Samuel 7:23 , and Psalm 58:12 and it can be used to refer to a single non-Israelite god, as in Judges 11:24 , Judges 16:23-24 , 1_Samuel 5:7 , and 1_Samuel 18:24 . Jehovah Elohim (translated in this instance as "Lord of the gods") is described as physically walking through the garden. 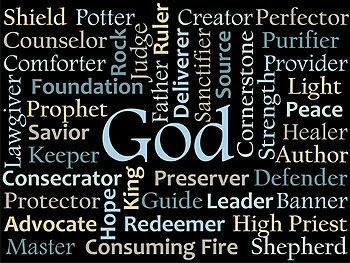 The ancient Hebrew name of God is the four-letter word YHWH (Hebrew: יהוה, Yāhwēh), which Biblical scholars refer to as the Tetragrammaton (Greek: Τετραγράμματον, Tetragrammaton; "four-letter word"). After the exile to Babylon, a tradition arose among the Jews that the name of God should not be spoken, to avoid breaking the commandment against taking YHWH's name in vain; in New Testament times it was only spoken once a year, by the high priest. Towards this end, the vowels were removed from the word (reducing it to the four consonants), thus preventing a reader from accidentally saying the word. Among the laity, it became customary to say "Adonai" ("the Lord") instead. When vowel points were added to the written text of the scripture, the vowel points of "Adonai" were sometimes written into the word "YHWH", in order to remind the reader to say "Adonai". After the destruction of Jerusalem and the dispersal of the Jews among the nations, the true pronunciation was lost. At the time of the King James translation of the Bible, scholars translated the Tetragrammaton using the consonants according to the Hebrew-Latin-English route that was common at the time (e.g. the Hebrew "י" translated to the Latin "I", which translated to the English "J"), resulting in the consonant combination "JHVH". To this they inserted the vowel points of "Adonai" with the consonants "YHWH" (it appears that the translators were unaware of the origins of that Jewish custom). The result was the English word Jehovah, still in use in many circles. Modern scholarship, working directly with better Hebrew manuscripts, now believe that Yahweh is probably closer to the original pronunciation. YHWH (Tetragrammaton) found in a fragment of the Septuagint. In the Hebrew, I AM THAT I AM is אהיה אשר אהיה, ʼẸhyẹh ʼAshẹr ʼẸhyẹh. YHWH occurs more than 6,000 times in the Old Testament. In modern translations it is usually written "the LORD", using small capitals. Occasionally, the phrases "Yahweh Adonai" or "Yah Yahweh" are used and the translation may say "the Lord GOD". This usage conceals the widespread use of God's personal name and encourages the false idea that YHWH and Allah (or some other pagan god) are the same. In the Septuagint, YHWH was translated by the Greek word Κύριος, Kyrios, meaning "Lord", and that is used throughout the New Testament. The word Κύριος was also used of the emperor, and the declaration "Jesus is Lord" was a direct contradiction of "Caesar is Lord". It should be stressed that both those phrases are claims of divinity. When a believer made that declaration, he was denouncing the emperor's claim to be a god and asserting that Jesus was God. For countless generations many arguments that attempt to prove or disprove the existence of God have been put forth by theologians, philosophers, scientists, thinkers and intellectuals. Till this day, the existence of God is still in dispute. There are a handful of common arguments that attempt to prove God's existence. The cosmological argument with its several versions is a very important argument within theism but philosophy of religion as well. The causal argument asserts that since everything that begins needs to have a cause, so must all of existence. Since no infinite regression is possible, there must be a first cause; this first cause was not caused and is called God. There is also the ontological argument states that if it is possible to imagine a being such as God, then the being must exist. The design argument (often referred to as the teleological argument) has been around since the time of the ancient Greeks, but it was Thomas Aquinas who made this argument famous in his work Summa Theologica. The older version of the design argument states that living things show the signs of design and thus must have been designed by a designer, God. The modern form of the design argument is called the Anthropic principle (or Fine-Tuning argument) and deals more with astronomy and physics than with biology due to the latest discoveries in the fields of Big Bang cosmology, quantum mechanics, and astrophysics. It postulates that since the universe, including all its laws and constants; the solar system, including the type of star and the arrangement of the planets; and the Earth, including its size and composition, allow for existence of life with such narrow margins for error that there must be a divine designer. Looking at the universe, space, stars and galaxies, Gottfried Wilhelm (von) Leibniz (1646 to 1716) began to philosophize about the origin of the cosmos and ultimately reasoned that there is a metaphysically necessary being behind the existence of the universe. A concept that articulates the nature of God, and the reason as to why there is anything instead of nothing. For any coherent concept of God, God must be timeless and therefore chronologically speaking there was no time in the past which God came into existence. Being eternal as well means God always existed. God did not ever begin to exist but rather is the very reason for existence. Due to this, by definition a metaphysically necessary being must exist. The non-existence would be logically impossible. This page was last modified on 12 June 2017, at 19:52.